Athens travel guide by Marinet. Visit the city where Democracy was born. Rhodes is the biggest island in the and the administrative center of the Dodecanese islands complex. 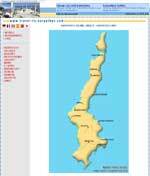 Kos is the closest island to the south at a distance of less than 10 miles. Leros lies a few miles to the north. There is a boat connection between the two islands. Patmos is the last of the Dodecanesian islands to the North. Reciprocal Travel Links Worldwide here.